We know some people want to have their own military-style semi-automatic AR-15 assault rifle. Despite the devastation this firearm inflicts on the human body, compared to that of a handgun, U.S. Rep. Ken Buck (R-CO) defends the rifle’s use for “pests,” like raccoons. Former State Sen. Laura Woods (R-Arvada) wants hers for killing coyotes. But this was the weapon used to murder 17 high school students in Parkland, Florida, so you’d think that, even if you loved the AR-15, you wouldn’t trot it out for the world to see at this particular moment in history. 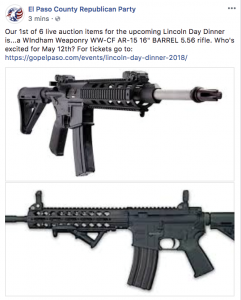 So why is the El Paso County Republican Party offering an AR-15 as one its first of six “live auction items” at its big Lincoln Dinner annual fundraiser, set for May 12 at the Antlers Hotel in downtown Colorado Springs. I put the question to the chair of the El Paso County Republican Party, Joshua Hosler. In addition to the AR-15s, El Paso Republicans will also be auctioning off a painting for the Fallen Peace Officer Memorial, Hosler added. The speaker at the dinner, by the way, who will likely precede the AR-15 auction, is U.S. Rep. Jim Jordan of Ohio, who reportedly packs heat. This topic contains 0 replies, has 1 voice, and was last updated by Jason Salzman 11 months, 3 weeks ago.